**** If you’re looking for the recipe (plus a great photo) for the Strawberry-Caramel Mascarpone Crepes that appeared on Vicki Archer’s blog, click here. The idea behind the French National Cocktail hour (June 7th, worldwide), is to gather friends over some French drinks (wines, apéritifs, etc.) and a few nibbles. Part of what’s wonderful about it is that it isn’t meant to be a huge deal. You see, we only think that the French make a fuss whenever they gather. Truth is, many apéritifs (cocktail-hour gatherings) that I’ve attended have been quite simple. However, leave it to me to turn the apéritif into what the French call the apéritif dînatoire — a cocktail party with enough food to double as a meal. I’ve invited some of my favorite people–and I won’t be seeing them a while, because I’m headed off to La Belle France for a few weeks. So rather than just cocktails, I’ve invited them for an evening’s worth of food and drink. I’m basically going to set out the food, buffet style, and have people nibble and sip their way through the evening. While eating in courses is more the “French” way, let’s remember that the word “buffet” is French, too. Here’s what I’ll be serving. Devilled eggs? Non! Too fussy. These are simply Oeufs Durs Mayonnaise. 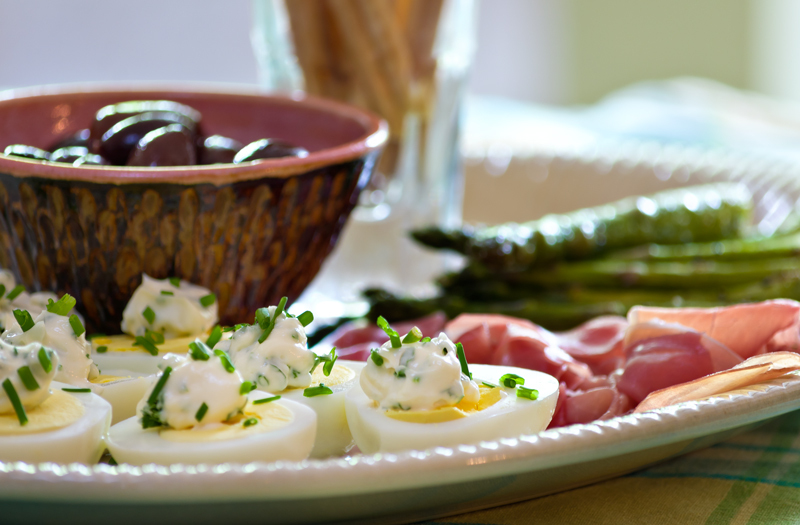 Served with prosciutto, olives, roasted asparagus, and breadsticks. 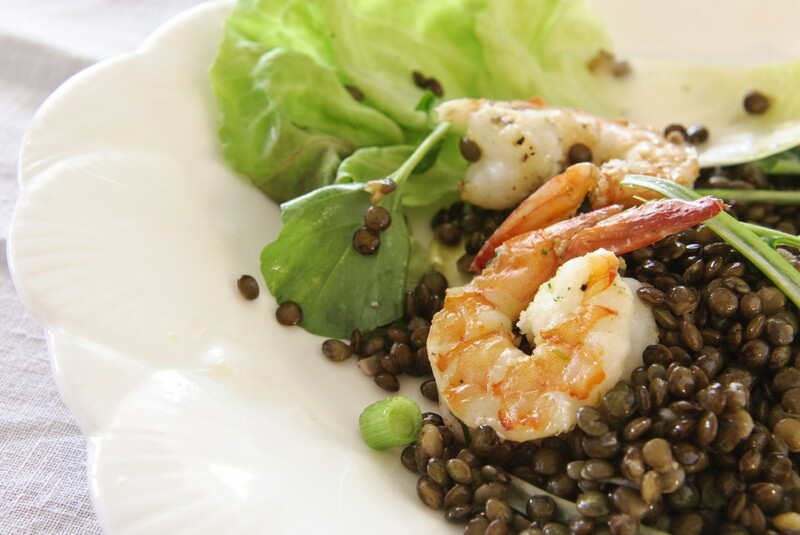 I'm going to put out a double-batch of this French Green Lentil Salad with Shrimp in one large bowl. It will count as a main dish. 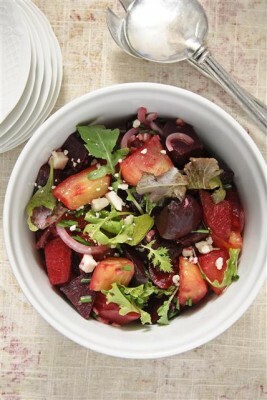 And of course, my Beet Salad with Blue Cheese. Adds a lot of color to the table, and heft to the offerings. 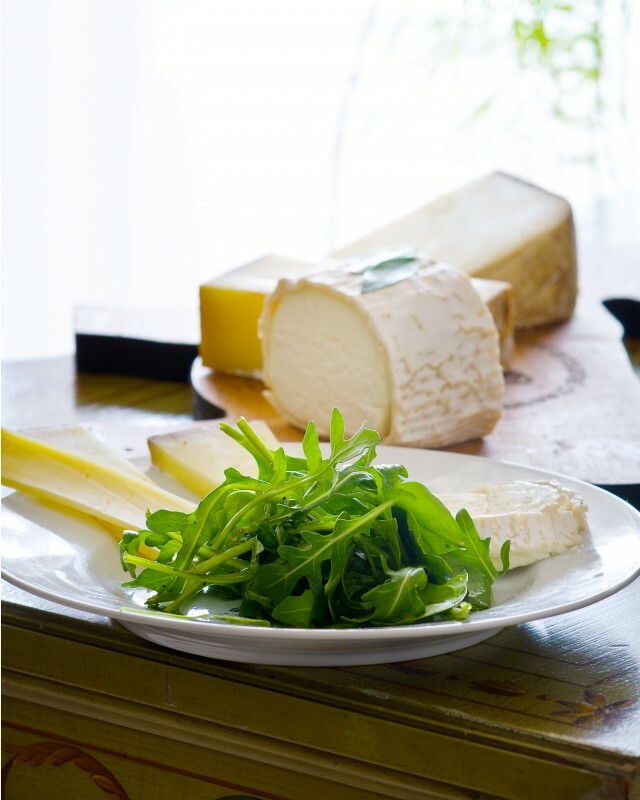 Of course, there will be cheese (though in this case, I might not serve it with the salad, as greens will be present elsewhere). As always, I'll have at least one goat cheese, one sheep's milk cheese, and one cow's milk cheese (pictured above: Comté, Ossau-Iraty, chevre. And for dessert? 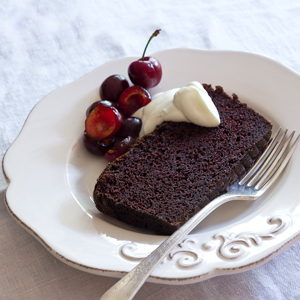 French Chocolate Pound Cake with Cherries. It's in the book, and one of my favorite ways with summer fruits. Goes with raspberries, strawberries, nectarines, apricots....the cake gets flavored with the liqueur and you serve fresh fruit alongside, with either sweetened crème fraîche or whipped cream. Great news: Almost everything can be made ahead…..Can’t wait. Will anyone else be celebrating French National Cocktail Hour? *** All above Photos by the Extraordinary Richard Swearinger. One more recipe: A blogger shared this great photo with me–and I think these things look amazing (how can they not be–they’re made with Roquefort, dates, and pecans?). While I’ve never seen pecans in France, if they had them, I’d imagine they’d make something like this now and then. 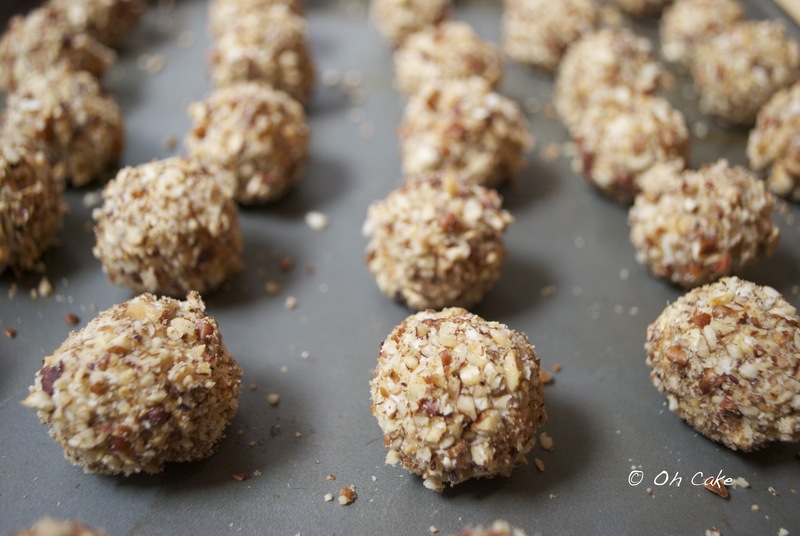 Date, Roquefort, and Pecan Balls from the blog Oh Cake. Photo reprinted with permission. For that recipe, head here. I love those date, roquefort and pecan balls! They look and sound awesome! And your salad is perfect as an Entrée, I love the combinations you chose.